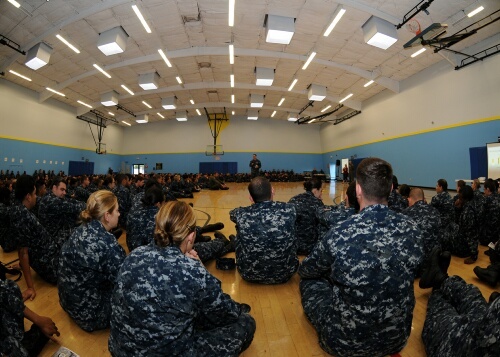 Officials have to be encouraged at the trend toward a safer on- and off-duty Navy, indicated by near-mid-year Naval Safety Center statistics. We type those words with a big “knock on wood,” of course. But with the fiscal year — which began Oct. 1 — nearly halfway gone, it’s looking like the Navy is shaping up, safety-wise — at least in terms of major mishaps, and on- and off-duty deaths. Class A afloat mishaps: two this year compared to four a year ago. The rate, per 100 ships per year, has dropped from 2.72 to 1.41. The rate for all of FY 2010 was 1.62. Class A flight mishaps are down slightly, from four at this point last year to the current total of three. There were seven in all of 2010 — a rate per 100,000 flight hours of 0.78. Compare that to a 10-year average of 14.1 Class A flight mishaps annually, and a rate of 1.37. Class A ashore on-duty mishaps: none this year compared to one at this point last year, with a rate per 100,000 persons per year of 0.00 compared to 0.60 at this point last fiscal year. There was only one such mishap in FY 2010, but nine in FY 2009. Total Class A on-duty mishaps are down for the year, at this point compared to last year, but already half of the FY 2010 total. There’ve been nine to date compared to 14 last year at this point; the current rate is 5.55, running slightly ahead of the FY 2010 rate of 5.18. Physical training fatalities: Still at one, as we reported in March, compared for five at this point last fiscal year. The rate, per 100,000 persons per year, is 0.62; it was 3.02 at this point last year. The 10-year average is 4.9 deaths and a rate of 1.25. On-duty fatalities are way down: There’ve been three so far this fiscal year compared to 11 at the same point last year, when the rate per 100,000 persons per year was 6.65 compared to the current 1.85. In all of FY 2010, the rate was 4.32. It’s in the area of private motor vehicle deaths that must be especially encouraging to Navy officials, however. Traditionally the biggest off-duty killer of military personnel — from fiscal years 2001-2008, nearly 67 sailors died annually in PMV mishaps — the fiscal year total to date is eight, compared to 12 at this point last year. At that rate, the fiscal year total would be but half of FY 2010’s 32 deaths. Four-wheel PMV deaths are down sharply as well: the year-to-date total is three, or half of last year’s year-to-date total. The current rate per 100,000 persons per year of 1.85 is well below both the FY 2010 rate of 5.18 and the 10-year average of 9.27. Motorcycle deaths are also down: four this year so far, vice five last year, compared to 13 for all of FY 2010. Off-duty and recreational fatalities — which do not include vehicle-related mishaps — are running even: three deaths last year and this year, to this point. The overall trend is positive, however; the current rate per 100,000 persons per year is 1.85, while the 10-year average is 4.47 — 17.4 deaths per year. The only negative statistic, in fact, is in the category of Class A on-duty motor vehicle mishaps. There’ve been two so far this fiscal year vice none during FY 2010, period. The rate this year to date is 1.23 per 100,000 persons per year; the 10-year average is 0.58. The sliding PMV numbers look good. But a continued focus will be needed to keep them that way. Summer approaches, when vacation and leisure time mean more off-duty travel time and increased risk, officials say.